Welcome to The Blockchain Report, your daily rundown for the latest in crypto. 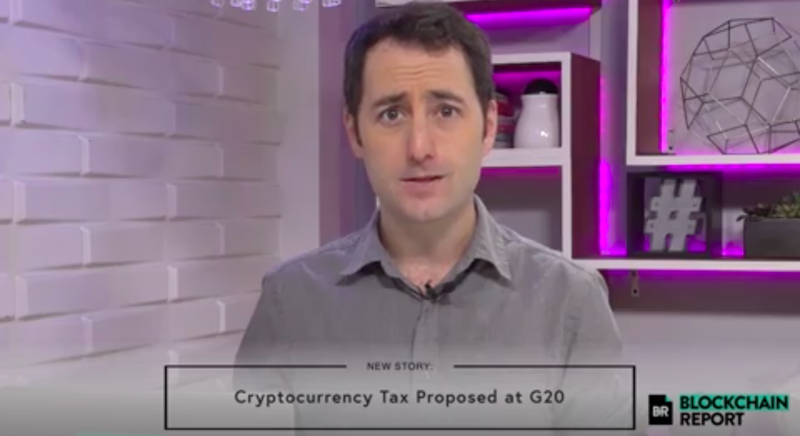 Our first story: some G20 countries proposed global cryptocurrency tax. According to Toshi Times, it appears that the G20 countries might come up with joint guidelines on how to tax cryptocurrencies. All of the G20 leaders were apparently given a document that explained the importance of taxing cryptocurrency and creating well-defined cryptocurrency regulations. The importance of regulation in the cryptocurrency industry cannot be understated, given the fact that the current financial regulations that exist do not adequately cover every scenario with cryptocurrency. The finance minister of France, Bruno Le Maire, asked for the G20 countries to discuss the issue of cryptocurrency in July. Le Maire also proposed that G20 countries should discuss Bitcoin and how to regulate it. Supposedly, the G20 countries are working on a taxation system for cryptocurrencies currently and will consider the issue again in 2019. A final proposal on how to tax cryptocurrencies will be created in 2020. Next up, a Federal Court rules in favor of Blockvest ICO in an SEC case. According to CCN, the U.S. federal court ruled in favor of an Initial Coin Offering (ICO) between the U.S. Securities and Exchange Commission (SEC) and the ICO, Blockvest. The federal court stated that the SEC failed to justify that the ICO was a security, which would cause the ICO to face a series of regulations that a non-security token would not have to face. The federal court argued that Blockvest is not a security because of how the tokens were distributed. What is important about this case is that it sets a precedent about what is and is not a security in the cryptocurrency market. It might also lead the SEC to become more wary about suing an ICO project. Blockvest tokens were distributed through an “airdrop”, an ICO distribution method in which the tokens are given away for free for people with digital wallets. One of the requirements of an asset being considered a security is if there is “risk of financial loss”. There is no risk of financial loss with airdropped tokens, because no money needs to be spent to receive them. And finally on today’s show, some Ohio Startup accelerators will invest $100 Million into Blockchain Startups. According to Coindesk, two startup accelerators in the state of Ohio will invest a little over $100 million into blockchain startups. An Ohio-based nonprofit that supports and funds nonprofits, called JumpStart, will invest $100 million into preliminary stage blockchain startups focused on business or government solutions. JumpStart will invest with six other funds in Ohio. Another business accelerator in Ohio that will invest in blockchain startups is called FlashStarts. FlashStarts will invest $6 million into pre-seed blockchain startups. In total, all of the investment funds in Ohio are planning to invest as much as $200 million into blockchain startups over the period of the next few years. Thanks for watching The Blockchain Report. Check out a clip below regarding “The Request Network”, and be sure to follow us on Instagram at @BlockChainReport.